MetroTwit has been discontinued and download is no longer available. Read the announcement. "If you like the Metro-styling..., this is the Twitter app for you. Seriously, it's one of the best looking ones out there." "Just installed MetroTwit Wow... this IS NICE! And feels so familiar! Great job folks!" "Being able to 'undo' specific tweets in @metrotwitapp is just genius. #makingsoftwaresexy"
"I really like @metrotwitapp. It was designed for the way I type. ;)"
@metrotwitapp Wow so sadly :( #MetroTwit best client ever for windows. Keep going for further projects, my best wishes! Just updated @metrotwitapp for the last time. 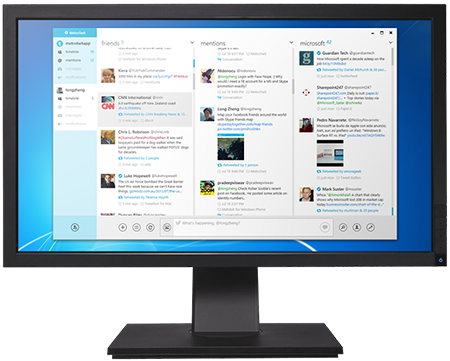 If only all Windows desktop twitter apps were this good. Thanks @metrotwitapp for being my app of choice. I don't look forward to replacing you. It was a good run, you're supposed to say, right?
. @metrotwitapp thanks for a really elegant, useful piece of software! you added a good thing to the world. Sad to hear @metrotwitapp is shutting down. 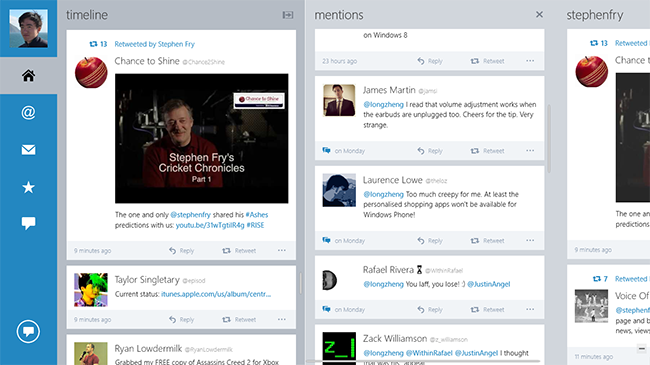 Easily the most beautifully designed Twitter app to hit Windows. @metrotwitapp Very sad, it's a great app, hope it keeps working for a long time! Thanks for your efforts. Drawing inspiration from Microsoft's Metro design language, MetroTwit celebrates an elegant and clean user interface that's beautiful to look at and a pleasure to read. Taking advantage of the latest Microsoft .NET and Windows Presentation Foundation frameworks, MetroTwit is a first-class application that shines on Windows. Tweet with me, myself, and I. Undo tweet is the fastest way to fix that silly spelling mistake before anyone notices. Flux capacitors included. Faster than a Peregrine Falcon. Even the fastest animal on the planet can't deliver a message as fast. With support for Twitter's Streaming API, you can now follow along hot topics and discussions in real-time. 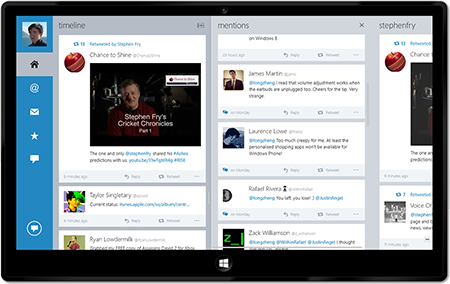 Designed as a native Metro application optimized for Windows 8 tablets.